If you can’t eat dairy or gluten, you are going to absolutely love this recipe because it’s incredibly satisfying thanks to the creaminess of hemp seeds and and cheesy taste from nutritional yeast. Sundried tomatoes round out everything in this dish with the perfect amount of saltiness. We love using pasta that’s made from legumes instead of grains, such as lentils, because it’s a wonderful source of protein and fiber. 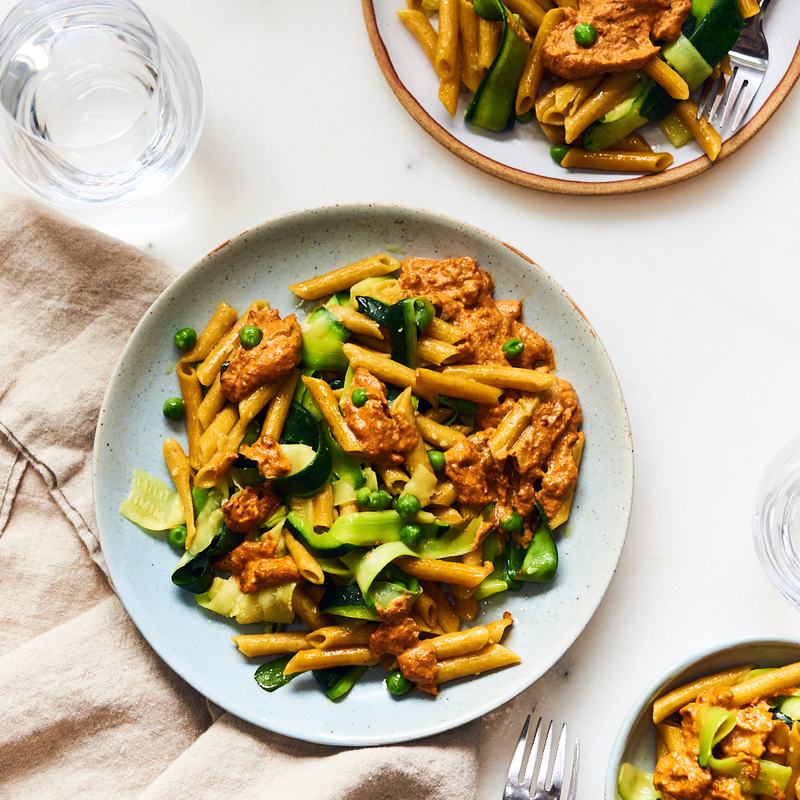 If you’re not eating legumes, you could actually make this recipe without any pasta at all and just add in extra zucchini ribbons instead, making this recipe compliant for the paleo style diet. We often think of leafy greens, like kale, as the ultimate vegetable for health. But, zucchini actually contains a wide array of nutrients too. Zucchini is especially rich in many of the B-vitamins, including B6 and folate. Studies have looked at folate’s role in supporting mood and cognitive function as we age, especially because of how important it is for the health of the nervous system. A deficiency in folate has even been associated with depression and some forms of dementia, including Alzheimer’s. Studies have also found that there is a link between low vitamin B6 and depression. 1. Prepare the pasta according to the package instructions. 2. Use a vegetable peeler to peel the zucchini into thin ribbons. Chop the garlic. 3. Heat a dash of extra virgin olive oil in a skillet and add the garlic for 30 seconds. Add in the zucchini ribbons and green peas and saute for 3-5 minutes until just lightly cooked. Don’t cook for too long because you don’t want the zucchini to get mushy. 4. Combine the sauce ingredients in a blender and blend until smooth and creamy. If it’s too thick, you can add a few more spoonfuls of water. 5. Once the pasta and the vegetables are cooked, combine together and add some of the sauce. You might not need all of the sauce so we recommend adding it gradually and mixing together, then adding more based on your taste preference.